Counterflow chillers are popular among home brewers because they’re so fast and efficient, but no one enjoys the bulky mess that they create when they get tangled up in your hoses and pumps. Well, now MoreBeer! 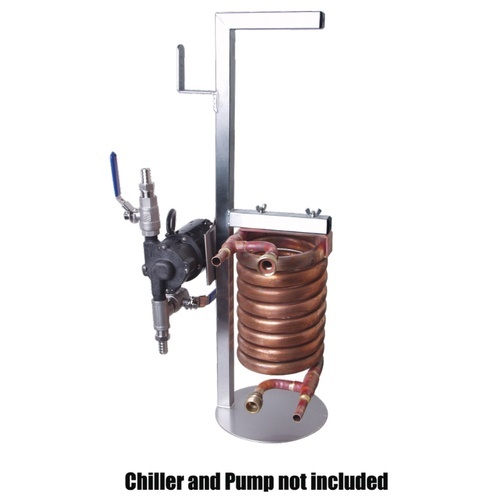 offers something to solve the problems created by your counterflow chiller: a counterflow chiller caddy designed specifically for mounting your beloved chiller! Our very own Order Fulfillment Manager, Ryan Barto, designed this handy caddy. It features a hook at the top to hold your tubing sets, rivets for mounting our optional March pump bracket and even wing nuts to help you securely attach the chiller right to the caddy. In order to control the flow rate through the chiller based on its temperature once it exits, Ryan recommends adding a ball valve and thermometer on the output side of the setup. He also notes that you can mount two counter flow chillers on one stand if you’re working on cooling wort for a lager brew. Depth from hose hook to end of mounting arm - 9.5"
Pump adds 1-1.5" in overall depth when mounted. I like the simplicity of the stand, but I wish it came with a sturdier base. I have one cfc and bought the pump bracket as well. With all the additional stuff I add to the pump, it makes for a barely stable stand. I'd be nervous to add a second chiller without securing the base to something heavy. I brewed a number of batches just setting my counterflow on the ground and what a mistake. I started using the caddy and it makes using the chiller so much easier. Well constructed. I agree the caddy is nicely constructed with beautiful welds. My only critique is that for the price I would expect the bottom plate to be flat. The unit I received allows the caddy to rock (one side being about 1/16" off the floor). Given the weight of the chiller, ball valve, thermometer, and potential future chiller and pump, I have concerns about its stability. If this is something others have encountered then a possible redesign for the base should be considered. Admittedly this is a bit pricey, but it's a very nicely constructed piece. It's a heavy duty piece of hardware. It's very stable and it's carefully thought out. the result is that it's even handier than I expected: not only is the pump off the floor and in a convenient configuration, but it's in nice proximity to the chiller. The hanger for cords and hoses is also very useful. A great product! I did the same as Joseph M, mounted two chillers on the caddy and let it rip! One pass and into the fermenter. I mounted a thermometer on the out and silicone thermoplastic hoses with stainless steel QD's on the fittings. I mounted two chillers to this caddy and can cool my wort to 68% in one pass with little effort. The wort can go directly through the chillers into my fermenter. Makes for quick work.